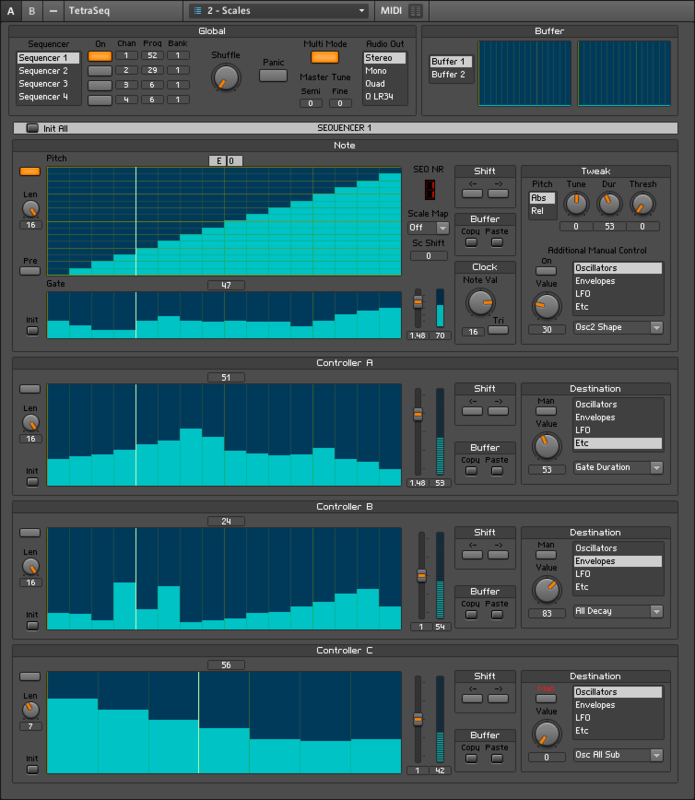 TetraSeq is a sequencer for Dave Smith’s analog hardware synthesizer TETRA. It should also work with Dave Smith’s Mopho, except that the Mopho has only one voice. Chances are it also works with Dave Smith’s Prophet 08. – Fixed: Inexact readout of mouse position for certain sequence lengths. – Changed: „Gate Duration“ as target instead of „Gate Length“, and correspondingly „Dur“ instead of „Hold“ at the controller knob. – Enable Info View to get help for individual panel elements. – Right-click or right-drag in a sequence table to set zero values. – The sequencer data is stored within the snapshots, so you can freely edit them without overwriting sequencer data across snapshots. If you create a snapshot for each sequence pattern to be used in a song, you can then select the sequence patterns from within the host sequencer by using MIDI Program Change commands. – You can copy and paste sequencer data across snapshots easily using the global buffers in the top right corner. – Only the visible data in the sequence table is shifted, copied or pasted. Thus, by varying the length of the sequence table, you can shift, copy or paste parts of the sequence.